"All the signs are there" for an impending nuclear test blast, said one intelligence official. The next test may involve a new type of weapon core for the North Koreans: highly enriched uranium. Two earlier tests are believed to have used plutonium as the weapon’s fuel. It is also possible North Korea could conduct two tests, one based on enriched uranium and one fueled by plutonium, the official said. A second official said the timing of dual nuclear and missile tests could come any time between now and Feb. 25 and likely will coincide with a political event on the Korean peninsula or in the United States. 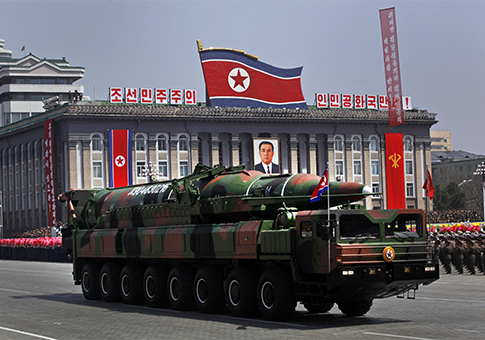 According to the officials, recent intelligence reports revealed last month that North Korea had moved some KN-08 missiles around the country. The new ICBM has not yet been test launched and the actual missile has been kept under wraps. Components of the missile system, however, have been tested. A flight test by the KN-08 would be a sign the new missile is close to deployment and would represent a new level of threat to the United States, the officials said. Bruce E. Bechtol, a specialist on North Korea and professor at Angelo State University, said a key to the next test will be whether high enriched uranium is used. "If they test an HEU device, it means that they are very close to having a weapon that they can put on a missile, likely the Nodong," Bechtol said. "We know this because they have the design for a 500 kilogram warhad (HEU) that can go on a missile which they received from the Pakistanis." On the KN-08, Bechtol said a test would be very significant. "It will drastically impact the warning time for U.S, and allied intelligence and make a preemptive strike much more of a difficult endeavor," he said. A Musudan test also would be the first official test of that mobile missile, he said. Then-Defense Secretary Robert Gates said in a June 2011 speech that, as a result of the new missile development, "North Korea is in the process of becoming a direct threat to the United States." Following a speech to Georgetown University, outgoing Defense Secretary Leon Panetta warned on Wednesday about "the threat of missile proliferation, particularly in North Korea, and the threat that that represents to the security of that region." Officials said one likely date for the North Korean tests is Feb. 25, the day South Korea’s new President Park Geun-hye will be inaugurated. Another possible date is near Feb. 12, when President Barack Obama is scheduled to give the State of the Union address before a joint session of Congress. Another date that intelligence agencies believe is a target for North Korean nuclear and missile tests is Feb. 16, the birthday of the late North Korean leader Kim Jong-il, father of current leader Kim Jong-un. Officials said the upcoming missile test could also include a test firing of the new Musudan intermediate-range mobile missile, which intelligence agencies believe is a variant of the KN-08. According to a State Department cable from 2009, the Musudan is a road-mobile intermediate-range missile based on Soviet SS-N-6 submarine-launched ballistic missile technology. It has a range of up to 2,480 miles, distance enough to hit U.S. bases in Okinawa and Guam. It is not known if North Korea has fashioned a nuclear warhead small enough to fit on its missiles. However, North Korea was a recipient of the covert Pakistani nuclear supplier network headed by A.Q. Khan that supplied nuclear weapons secrets to Libya, Iran, and North Korea in the early 2000s. Documents obtained by the United States in Libya after the Khan network was exposed in 2004 revealed that the network transferred Chinese-language documents that included designs for a small nuclear warhead that could be mounted on a missile. Concerns about a new military provocation by North Korea were highlighted by the release of a propaganda video showing a simulated missile attack on the United States. The video, accompanied by the song "We are the World," shows simulated missile strikes on buildings in what appears to be New York City. It ends with the launch of North Korea’s Taepodong-2 launch in December that the Pentagon described as a long-range missile. The Obama administration has sought China’s help in dissuading North Korea from conducting the missile and nuclear tests. However, China has taken an ambiguous public posture toward North Korea, considered a close fraternal communist ally. Chinese Foreign Ministry spokeswoman Hua Chunying was asked on Monday if China would discourage North Korea from carrying out a nuclear test. "Properly dealing with the Korean Peninsula nuclear issue and safeguarding peace and stability of the peninsula and Northeast Asia serves the common interests and is also the shared responsibility of all relevant parties," she said. "China is committed to the realization of denuclearization as well as peace and stability on the peninsula," Hua said. "This position is clear and consistent. We call on parties concerned to refrain from taking actions that may escalate the tension in the region, and hope more could be done to ease the tension so as to jointly safeguard peace and stability on the peninsula." The United Nations Security Council passed its latest resolution again condemning North Korea for a Dec. 12 test of a long-range missile on Jan. 22. The resolution said the world body would take further "significant action" if additional tests were carried out. North Korea’s National Defense Commission (NDC) issued a statement two days later denouncing the world body for the "illegal" resolution, and asserted the missile launch was a space launcher for a satellite. The statement promised "all-out action" in response to the resolution. The NDC statement concluded: "We do not hide that a variety of satellites and long-range rockets which will be launched by [North Korea] one after another and a nuclear test of higher level which will be carried out by it in the upcoming all-out action, a new phase of the anti-U.S. struggle that has lasted century after century, will target against the U.S., the sworn enemy of the Korean people." "Settling accounts with the U.S. needs to be done with force, not with words as it regards jungle law as the rule of its survival," the statement said.